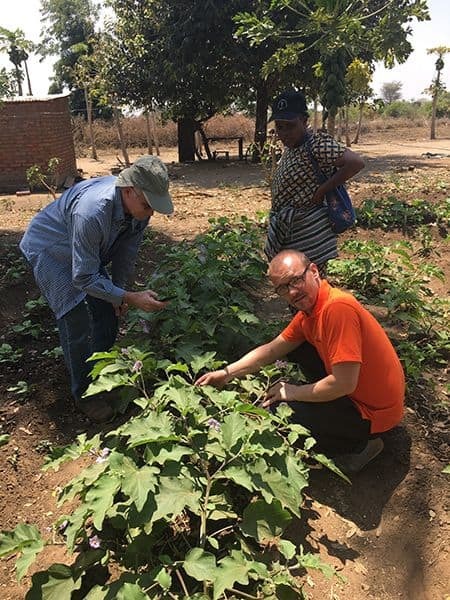 Through the USAID/Feed the Future-funded Africa Rising and Homegarden Scaling projects in Tanzania, the World Vegetable Center equips trainers with the knowledge they need to teach others how to grow nutritious, health-promoting vegetables. 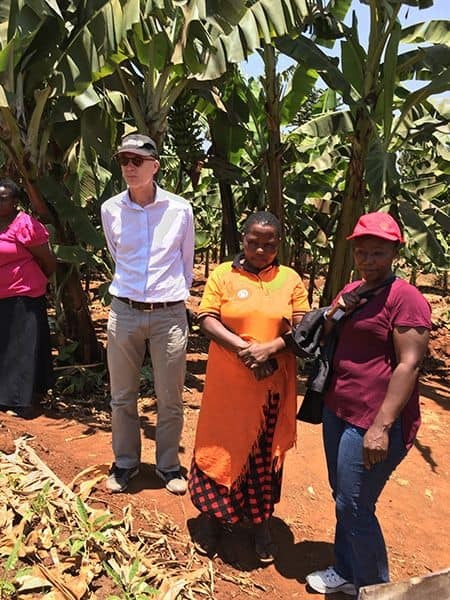 On 23-24 September 2017 a WorldVeg team including Director General Marco Wopereis, Deputy Director General – Research David Johnson, and Eastern and Southern Africa Regional Director Thomas Dubois joined Radegunda Kessy, Ralph Roothaert, Justus Ochieng and Inviolate Dominick to visit five project farming families in five villages (Galapo, Dudiye, Bermi, Magugu and Kakoy) in Babati district. 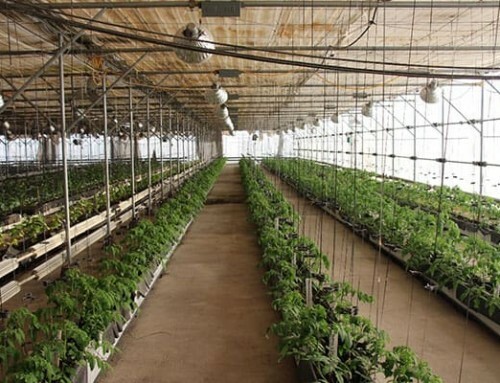 Activities under the Africa Rising project in Galapo include on-farm research of best technologies, including healthy seedlings of improved vegetable varieties, Good Agricultural Practices (GAP), and protected cultivation. The most popular crops produced by project participants were, in order: African nightshade, amaranth, African eggplant, okra, and cowpea leaves. Monica Pascal (orange dress) shows the WorldVeg team her family garden. Monica Pascal from Galapo village is one of 16 farmer trainers in Babati trained through the Africa Rising project since its commencement in 2013. 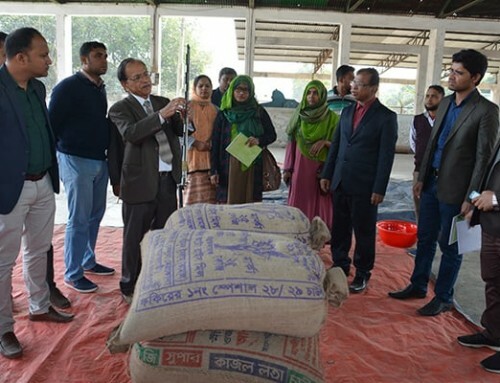 She learned vegetable production methods including IPM practices and vegetable-poultry integration, such as using vegetable residues as poultry feed, mechanized poultry feed production, and inclusion of poultry droppings as organic manure. She has trained 60 farmers inside and outside her village to adopt GAP and use these new production technologies. 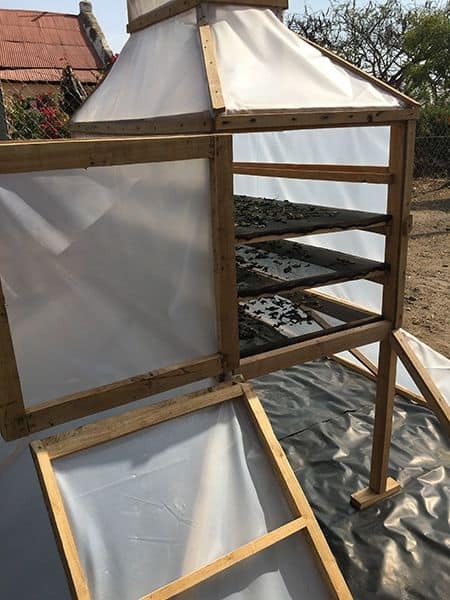 She recommends growing vegetables in a screen house rather than in the open field, because a screen house fosters more rapid growth, produces safe vegetables, reduces the cost for pest management, and extends the harvest. Monica, her husband Pascal, and their children work together to grow vegetables on the family farm. By following these new practices, they have improved their farm’s yield and income—and in the process added diversity to the family diet. Monica and Pascal have been able to construct a house, pay school fees for their children, and purchase other household items from the income they realize from selling vegetables. Faustine Bathelomeyo in Bermi village is a young farmer who joined the project in December 2016 as a trainer. Although he has farming experience, Faustine was exposed to some new methods and technologies through the project. 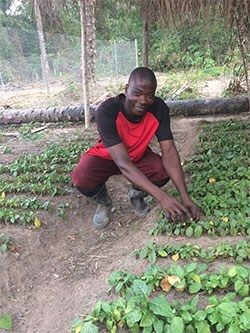 Faustine participated in an experiment on protected cultivation, and after giving the practice a try he decided to expand his garden by growing more tomatoes and African nightshade under cover. 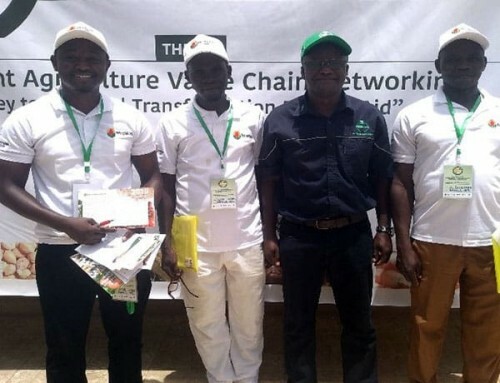 Faustine helped to bring project technologies to scale and played a key role in training other farmers and encouraging collective production activities in the village. Dudiye and Kakoy villages participated in home garden activities. The WorldVeg team visited four households, where farmer-to-farmer technology diffusion was observed. Franciscka Dominick and Martin Giro are among 76 community-based trainers (CBTs) in Babati district who were elected by community members. After receiving training on good agricultural practices, nutrition, vegetable preparation, seed production, IPM, and other practices, they conducted sensitization meetings at community gatherings, provided training to farmers, and supported families in establishing home gardens. All households reported an increase in nutritional knowledge and greater consumption of vegetables now, compared to before the project. After grandmother Luciana Muhale in Dudiye village participated in a sensitization meeting and training in May 2017 she planted her own garden in raised rows—and also trained her sons to do the same. 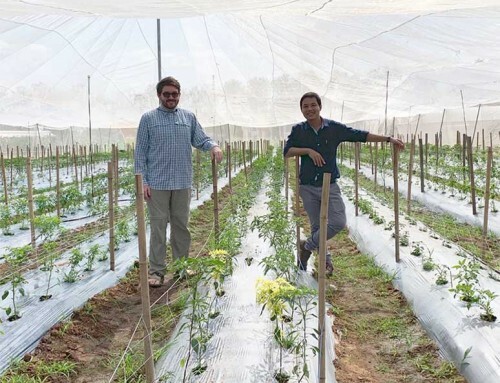 The rainy season convinced them to try keyhole gardens and sack gardens; these planting methods drain well when it rains and conserve moisture when it is dry. Luciana’s sons plan to teach gardening to their own children, to ensure the next generation understands how vegetables contribute to good health and how simple it is to grow nutritious vegetables at home. WorldVeg staff admiring eggplant on a project farm. A solar dryer constructed as part of project activities.